Overview: Minnesota is a polyglot state. Over 95 different languages are spoken in the homes of children in Minnesota’s public schools, according to the Minnesota Department of Education. These language include such rarities as Persian, Icelandic, Wolof and Yao, but the six major languages other than English spoken in Minnesota are (in descending order of frequency) Spanish, Hmong, Somali, Russian, Vietnamese and Arabic. 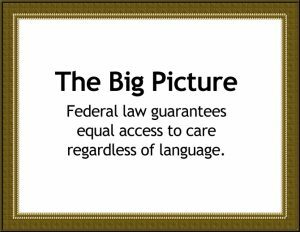 Federal laws and state regulations guarantee equal access to all patients in a health care facility, including those with limited English proficiency. The U.S. government defines people with limited English proficiency as those who do not speak English as their primary language and who have a limited ability to read, speak, write, or understand English. Someone who has limited English proficiency may be highly educated and speak several languages other than English. Interpreters and translators, once infrequent visitors to health care facilities, are fast becoming indispensable members of the health care team. They can help monolingual health care providers bridge the language gap. What’s the difference between interpretation and translation? How do I know if my patient needs an interpreter or translated materials? What if my patient does not read well, even in his own language? Q. What’s the difference between interpreting and translation? A. The goal of both interpreting and translation is the same: to convey the meaning of a message from one language to another. The meaning is the most important part of the process in both interpreting—which deals with spoken messages—and translation, which deals with written messages. Standards of practice in medical interpreting are available on the website of the National Council for Interpreting in Health Care. Q How do I know if my patient needs an interpreter or translated materials? A. The simplest way is to ask. Asking about a patient’s race, ethnicity, or language preference is not illegal or discriminatory, and is, in fact, a hallmark of good care. Most patients appreciate being asked in what language they prefer to receive oral or written information about their health. Q. What if my patient does not read well, even in his own language? Sometimes pictures really are worth thousands of words. A. If a patient does not read English or their own language well, they may benefit from taped or video materials, if available. 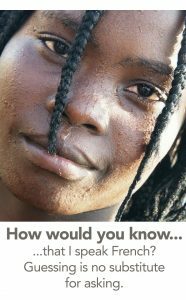 But print materials still can be used to reinforce important health messages. Written materials can be read to a patient by family members or interpreters. Interpreters can use print materials as references. Pictures on materials designed for English-speaking patients with low literacy can be keys to understanding for LEP patients as well. Health care coverage site for Spanish speakers This U.S. Department of Health and Human Services site, CuidadodeSalud.gov, offers Spanish speakers information and resources that will help them find quality, affordable health care coverage. Web training tool helps with language services The Health Care Language Services Implementation Guide is a Web-based interactive tool developed by the US Office of Minority Health that can assist health care organizations in planning, implementing, and evaluating language access services. Better Communication for Better Care: Provider Tools for Diverse Populations Resources produced by the Industry Collaboration Effort of Health Plans. Contains lists of companies that provide interpreter-related services and more. Health Information Translations An Ohio-based collaborative initiative to improve health Education for Limited English Proficiency Patients; includes a searchable database of hundreds of materials. UnitedHealthcare’s Spanish-language Web provides bilingual (English/Spanish) information, resources and interactive programs designed to engage Hispanics in playing a greater role in their health and well-being. Additionally, visitors can locate Spanish-speaking physicians within UnitedHealthcare’s nationwide health care provider network; find healthful recipes to help improve their diets; take part in activities such as quizzes and calculators that help them assess their risks for certain illnesses; and much more. MedlinePlus now includes a multilingual feature, providing access to high quality health information in languages other than English and Spanish. The collection contains links to information in more than 40 languages and covers nearly 250 health topics. Interviewing Clients Across Cultures: A Practitioner’s Guide. Guide covers nonverbal communication in interviews; working effectively with interpreters and building rapport. Medical Spanish interactive tutorial This website offers a self-paced medical Spanish immersion, with vocabulary including greetings, history, examination, and everyday speech, all with translation and audio. It is designed to be helpful for a variety of medical personnel. Hablamos Juntos II – Language Policy and Practice in Health Care: Initiative funded by the Robert Wood Johnson Foundation to disseminate lessons learned from ten demonstration sites around the country and to set standards and create practical tools for developing useful health materials in languages other than English. Principles for Broad-Based Funding Mechanisms of Interpreter Services: Developed by the Minnesota Interpreter Standards Working Group, November 2007.